Note Writers fine point felt tip pen. Ink color matches barrel color. USA Union Made and Union Printed. For a more traditional writing experience, look to our Note Writers®! This pocket marker's flexible fiber point allows for fluid, distinctive writing with a fine line. The Note Writer's water based inks are quick drying, non toxic and non-fading. Perfect for Adult Coloring! Color Selection: Available in Black, Blue, Red, Green Barrels with Matching Ink Colors. Additional Color Combos available. Contact factory for details. 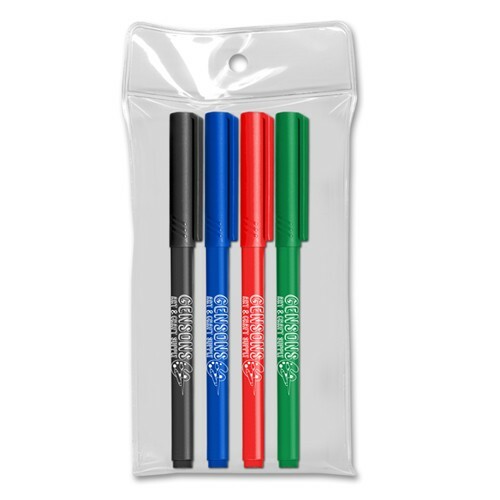 Price includes a one color imprint on each marker barrel.